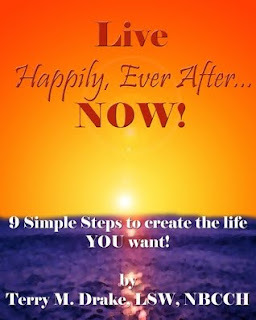 Cryss Loves Stuff: Book Review: Live Happily, Ever After... NOW! Book Review: Live Happily, Ever After... NOW! For over 10 years, Terry M. Drake has been a family therapist, supervisor and life coach who specializes in teaching people how to get what they want. He currently is a Director of mental and behavioral health programs, as well as in private practice as a hypnotherapist, life coach and trainer. Live Happily, Ever After... Now! Uses age old, time tested secrets (found in NLP, the Law of Attraction, Positive Psychology and Ericksonian Hypnosis) to teach you how to create the life you want. The key is learning how much control you actually you actually have over your life, you beliefs and attitudes about yourself, others and the world you live in. Once you understand that you are in control (and you will), then you can use the 9 simple steps to make changes and begin living the life you want. I have been implementing changes into my life using the Law of Attraction and Positive Psychology, so I was very interested to see what additional information I could find within this book that would assist in additional transformations. I was very pleased with the food for though that is contained within these pages. It is a very easy read and everything is laid out in a manner that is straight forward and easy to follow. If you are new to some of these philosophies I would recommend reading each chapter individually and then attempt to practice those ideologies in your day to day life. Each chapter has a story (most of which are credited to unknown authors) that captures an idea that is contained within the chapter, one of those story is a favorite of mine about called Two Wolves. Each chapter also has a summary and a number of quotes. One of the chapters discusses the need for perfectionism and the fear of failure. Both of which, hit close to home for the hubby and I, in the form of personal limitations that we are trying to break free from. I would recommend this book for anyone who finds that their life is governed by negative thinking that has been keeping them from the happiness they so desire but might not feel they deserve. Disclaimer: I was provided a free copy for the purpose of this review from Pump Up Your Book book tours. Crystal Porter is a Canadian Mom and Musician who lives in Rural Nova Scotia. She is a Singer/Songwriter who enjoys music, blogging, gardening, health & wellness, video editing, fitness and reviewing products. This blog contains all the things that she loves.